New word production seems a bit thin on the ground so far this year. We’re nearly a third of the way through 2014, and I find that the annals of Wordability seem to have less to report on than normal. But one area that is as fertile as ever is Twitter, and in particular reminders that it has spawned an entirely new type of word. I refer of course to the hashtag, which is both a word and yet not a word. Originally an easy way to search for content, the hashtag has evolved into something which in time might come to be recognised as a new part of speech altogether. By taking a short sentence and sticking it together with no spaces, a new term is formed as a way of summing up the sentiment expressed in the tweet which precedes it. The hashtag becomes a commentary, or maybe a contextual aside to give more depth to what has been said. In a medium where 140 characters are king and each character has to count, these hashtags have come to be a way to express far more than the tweet allowance normally permits. I found myself thinking about this following this week’s incident involving Barcelona footballer Dani Alves and a racist taunt from the crowd. His brilliant riposte at having a banana thrown at him was to pick up the offending fruit and take a bite, before continuing with the game. But what was more magnificent still was the social media reaction. 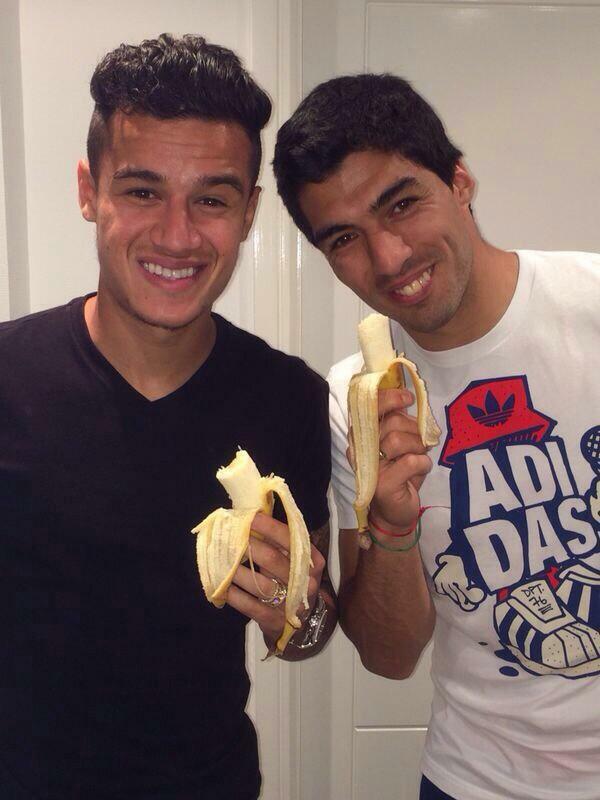 Many notable footballers took to Twitter to post photographs of themselves eating bananas, and the banana habit swiftly became a viral phenomenon. But rather than new term such as Tebowing coming to the fore, at least not so far, the tweets all came with a hashtag of solidarity, namely #weareallmonkeys. So what does the use of this hashtag tell us about language? Well firstly, it’s a bit like a badge, you in effect wear it on your tweet to show that you support the cause. Secondly, it’s a great example of words run together to create a meaning above and beyond that which is expressed in the original sentence which spawned it. If you had to define this example, you’d end up with something which nods to support for Alves’ action, is a general support for anti-racism work and also articulates the point that humans are all derived from the same source and that those who fail to understand this really should learn to. Not bad for four words strung together. But finally we need to consider its status as a new word. It’s clearly not a word that will have a long life and end up in the Oxford English Dictionary. But in the language of Twitter, it is a new word, and it is used to mean all of the the things I have suggested whenever anybody appends it to their tweet. In this context, it has all the attributes of being a new word, though not in the conventional sense. It is clear that as technology changes the way we communicate so the words that we use will change to keep pace. But what is becoming increasingly apparent is that the structure and formation of language itself is going to start to change, with new rules, new formations, and as hashtags suggest to us, new parts of speech. Or as they say on Twitter, #theenglishlanguageisalwayschanging. Has Normcare Made Me Fashionable?